Training book, leads and other gifts available from our on-line shops. Dog training without treats. £14.95, free p&p. Click on the ‘shop now’ link. Adrian Howe has trained many hundreds of problem dogs in his career. He started out by working with aggressive dogs, the dogs that other trainers and behaviourists either avoided or failed to correct. Some dogs had been labelled ‘untrainable’. He learned the hard way which methods worked and bears the scars to prove it. Treat training was quickly discarded as well as harsh or punitive methods which made a dog more fearful. Clients talked about the man who could change a dog’s behaviour within hours. Rescue centres and veterinarians recommended him to their clients. Adrian developed a training programme for owners and dogs which would change their lives in less than 3 hours. The programme covers common problems experienced by the average dog owner and good solid training methods which work on any dog. His methods are simple and effective. 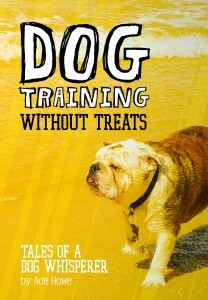 Considered by many to be one of the best dog training books in years his book reveals some of his secrets. Welcome to the Dynamite Dog Store. Click on the ‘Shop Now’ button below and you will automatically be taken to our on-line shop where you can purchase a hardback copy of the book ‘Dog training without treats’ tales of a dog whisperer by Ade Howe. All card purchases will be directed through a secure server and for your security no credit card details are stored on this site. There are lots of interesting gift ideas at Zazzle. T-shirts, mugs, cards, magnets, hats, bags and other gifts that you can have printed with a picture of your pet or relation. Click on any of the links below or design one yourself from scratch. 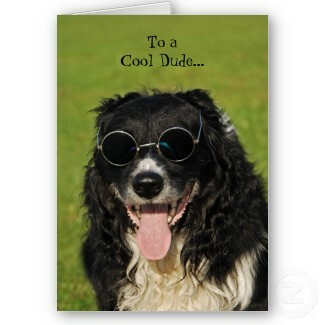 We have a range of dog cards for various occasions, some with amusing captions and the greetings and captions can be altered to your liking.